Templis CALSF was formed in February 2012. We are the longest running alliance that has been in constant service to the Caldari State, fighting alongside the State Protectorate and Caldari Militia. This record serves as a history of our most notable events. Templis CALSF was formerly known as Templis Dragonaors. When this alliance was first formed in February 2012 the idea of DUST514 didn’t really exist (more on that later) and having a name similar to NPC entities in EVE was not a huge issue back then. As a play on Commander Tibus Heth’s Templis Dragonaurs (sp) it was, at its heart, an ultra-nationalist Caldari terrorist organization (we prefer loyalist) whose origins date back to the Tikiona States. They are easily the most anti-Gallente political entity in New Eden. As EVE Lore would go, the organization was secretly involved in the destruction of Nouvelle Rouvenor. Tibus Heth was supposedly a member for six years, although his involvement was never officially proven. Which certainly fit our model for Faction Warfare. That was the lore back then and it gave the cultural foundation to this alliance. Even during its early days. Dark Circle Enforcement was the original executor of Templis. Lead by Cory Braum they became an effective alliance that fought alongside EvOke, Happy Endings, Black Rise Guerilla Force and Section 9 Alliance. The latter of which was founded by the Caldari Colonial Defense Ministry (CEO Ian Wolf) and Progressive State (CEO Commissar Veldt). Section 9 was a smaller alliance with strong ties in the UK Time Zone and North America. An earlier ad for Templis Dragonaors Alliance circa March 2012. 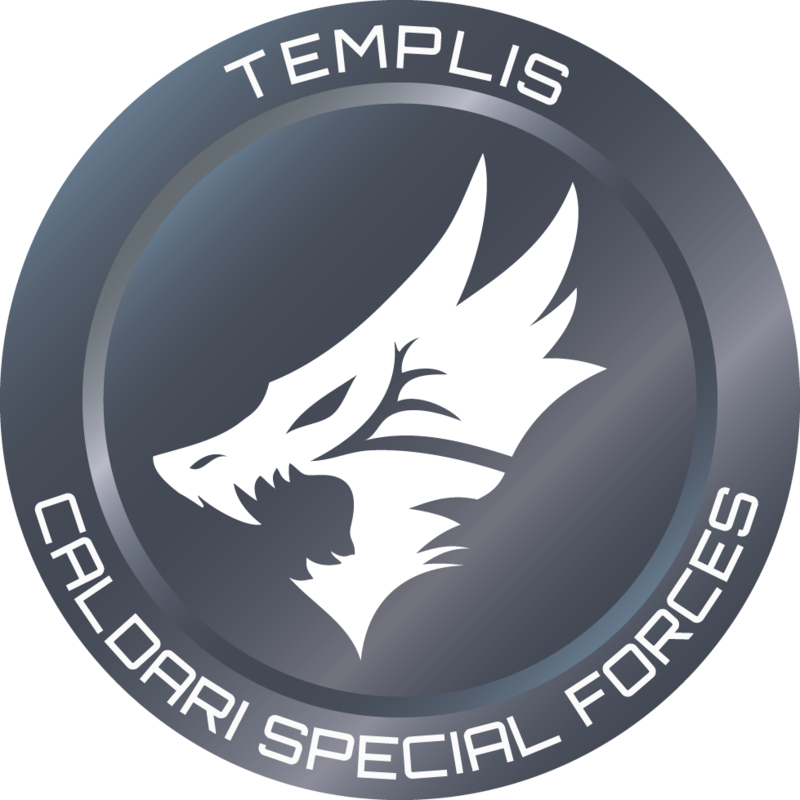 Leading up to changes in Faction Warfare mechanics and activity in our original alliance, Caldari Colonial Defense Ministry (CCDM) left Section 9 and joined Templis Dragonaors. Little did we know, this change would lead to an enormous amount of content for those flying with us and change the scope of the game for us. In early December 2012 the decline of the old guard started. In part due to the sweeping changes in Faction Warfare, the resetting of the map, and unfortunately, the leverage that it offered the enemy. Too much was given to the victors. Of course none of this would come to light immediately, and by the time it did, any further tweaking before “Retribution” was null and void. It was only a matter of time. Scylus Black and Shahai Shintaro were voted in as Co-CEO’s for CCDM. With former CEO and founder Ian Wolf leaving Faction Warfare. While our role was small, our pilots were on field for one of the most notable battles in New Eden history: “The Battle of Asakai”. This event saw the destruction of Titans and brought thousands of new Capsuleers into the game… And we were there! That was the beginning of the end. Over the next few weeks, especially since “The Fall of Enaluri” in April 2013, it would drive many of those listed above to Null Sec or a world of piracy. Abandoning Faction Warfare and leaving those of us still invested in PVP and the fight to grow or follow suit. The general thought process in Templis Dragonaors and Section 9 was Caldari Militia still needed support and guidance, which at the time, proved to be far less organized and effective than our foes in the Federation. When the aforementioned groups gave up and left, we opted to remain. In May of 2013, Scylus Black, CEO of Caldari Colonial Defense Ministry [CCDM] was voted in and made Executor of Templis Dragonaors. The previous executor corporation, Dark Circle Enforcement and its leader Cory Braum left for Amarr space. With new leadership in place, the effort to establish our new culture and align member corporations began. An Alliance Charter was created and ironed out with standards to be upheld. This would outline how we would operate and ensure a drama free and stable alliance. It covered many aspects to ensure we did not struggle with the problems we had before. The culture prior to any change in Templis was not one of unity or brotherhood. In fact several of the members were looking to leave Templis prior to the Executor-ship change, CCDM included. Shahai and Scylus had put together a plan that if things did not change we would leave and create our own alliance. As luck would have it, CCDM ended up as Executors. It now fell on them and their leaders to demonstrate and work with the remaining members and show that something could be done with the team. An example and missed opportunity from the previous leadership was “The Battle of Asakai.” (Original Mittani Breaking News Report). CCDM was asked by Liandri Covenant to help defend their POS. We reached out to our alliance for back-up and support in this. It fell on deaf ears. Something that happened more often than not. Little did anyone know it would be the largest Low-Sec Battle of its time. We also knew we needed to create an alliance logo to finalize our transition from the old regime to the new. We also understood the need to create an identity and the added credibility that came with an accepted logo. We evaluated several ideas for an alliance logo before agreeing on the Dragons Heads Medallion posted above. It was submitted and Approved. For posterity sake, the blue one was also an option that influenced the final logo but was ultimately passed on. It was also during this period that we separated from our colleagues. Caldari Militia was struggling with routine. They were stagnating. We made the decision to relocate from Okkamon to Innia, in the heart of Gallente controlled territory. We were the only Caldari Militia group in that system at that time and looked to bring the fight to the Gallente’s front door. This was big deal at the time when the rest of Caldari Militia resided in High Security space several jumps away. We set up base immediately next door to the Gallente stronghold of Eha in Low Sec. It was not without challenges: harassment from local pirates and the added logistics to resupply ships in low security space, however we stuck it out. We solved the freight logistic problem and our pilots improved their game against the pirates and Gallente. Although we lost the system over one long siege weekend with limited to no support from Caldari Militia, we mounted a counter assault and reclaimed it two days later and held it for the next 279 days. Around this time, a lot more of the general Caldari Militia decided to reside in Innia alongside us. Many of the Templis old guard will say some of the most epic fights and greatest skirmishes happened during that period. That weekend, Innia was the most violent system in all of New Eden up until that time. Another milestone and epic event. (although this is certainly not the last time that we’ve been responsible for hosting the Most Violent System in all of New Eden). That one weekend solidified our efforts and changed our attitude towards the rest of Caldari Militia for the foreseeable future. Even with requests for support and not gaining it we fought long and hard. We sent a message to Gallente Militia by holding our ground despite the odds and were reminded of our continued need to be self-reliant and supportive of the alliance. You can read about some of our changes since this time in this article at Crossing Zebras. Part of our evolution as an alliance is to open up more to develop others and share what we have learned. We may not have received the support one would have expected from their own militia however we received this from the Gallente Militia Corporation Justified Chaos Deen Wispa – “I tip my hat off to Templis Dragonaors. Despite losing the system, they fought with tenacity and ferocity. Those are two qualities lacking in many CalMil corps nowadays.” To this day, the culture within Templis is one that drives to earn respect from our enemies. Win or lose, we do not cower. We bring the fight. In December 2013, our alliance was anonymously reported for violation of the EULA for impersonation of the Templis Dragonaurs DUST Corporation under section 6.C as it relates to the Terms of Service item 8, impersonation. As such, our alliance was renamed to a number and given 24-Hours to come up with a new name. It was a brief and frustrating period as we had worked hard to come together and create this. Thankfully, CCP GMs were ammenable to us changing the name and logo without including the “Dragonaors” name or variant. They also expedited the logo replacement (Thank you CCP). While unfortunate that this happened and disappointing that “someone” felt the need to submit a petition against us to begin with, we are decidedly better off with the change having happened. Our history and results speak for themselves. Just another part of our evolution and story. Templis CALSF really began to come into our own in 2014. While frigate and destoyer doctrines were the Faction Warfare meta of the day. Our leadership saw an escalation to larger hulls on the horizon. It was something that Gallente Militia was already starting to do and we didn’t want to get left behind. As stated before and as will be stated again, we are a combat team and we hold our own members to high expectations. In that same vein we also understood that growing into larger hulls was important to retention of our best combat pilots and fleet commanders. In fact several fights and an evolution from this era were captured by Stalence and posted to his personal YouTube channel. He has since started posting videos to the official alliance YouTube Channel. In August of 2014, the Gallente Militia made a concerted effort to capture the entire war zone. Fortress Innia was one of the last systems to fall. After it did, the alliance briefly relocated to Kinakka which was still held by the Caldari State – largely due to the presence of WAFFLES living in the system at the time. This relocation was short lived as well though as The Gallente did eventually force us to withdraw into neighboring high-sec and non-faction warfare low security systems. Here is an article detailing efforts to prevent the total capture of the War Zone and a retrospective on it after a few months had passed. Morale among the entirety of Caldari Militia was quite low at this time and combat pilots were departing for other areas of space. Templis CALSF leadership smartly made the decision to relocate from Black Rise to The Citadel and assault systems in the war zone’s south. It was both a new area of space for us and it gave us a bit of separation from the Gallente Militia old-gaurd in Black Rise. It gave our pilots a renewed purpose to reestablish a foothold in the war zone and reinvigorated our ranks. Originally staging from high security space, a foothold in the war zone was recaptured in Hysera. Shortly thereafter, on 5 September 2014, Templis CALSF had captured the neighboring system of Hasmijaala and up residence in the system as the primary occupants. For nearly the next two years we lived in Hasmijaala and fought in the South, our charter to defend and capture systems in The Citadel. Notably, while morale was low-militia wide and led to an exodus of players from the Caldari side, from a coalition perspective, it strengthened the bonds between the alliances and led to a lot of new policies, strategies, doctrines and ideas that will make us stronger than ever. Yes, we lost multiple strongholds (and the whole warzone for that matter) but we came back stronger than ever and those groups that didn’t fold and leave the Caldari are here to stay, no matter the odds. After establishing ourselves in The Citadel Scylus Black transitioned leadership of day to day operations and acting CEO role to Omar Jumper with Auroraqual serving as his deputy and leader of the alliance’s logistics arm. While Scylus Black still technically retains title of CEO within CCDM, his contributions today are more appropriately labeled as the True Executor of the Alliance. He works to ensure that member corporations are getting the support they need from the alliance and he actively works to screen and recruit new corporations into the alliance with the aide of Roxie Orvis. The creation of a spy network, introducing spy characters in enemy corporations and alliances. The new area meant new, unsuspecting prey. Nearby gate camps in Tama proved to be especially fruitful for our BLOPS drops. During our time in the Citadel we were also setting new records for destruction. Perimeter Defense Systems, was causing pain and frustration to the point that the “Grimwood Special” or “Deny The Gallente” model was getting considerable attention within the EVE Online forums. “…Although I hate fighting Templis because of Grimwood and his MacGuyver-esque duct taped WD40 1-mil isk frigate specials…” Gallente Corporation Rapid Withdrawal. Grimwood thanks for bringing the fight day in and day out. Original EVE Online Post. While derp frigates and destroyers continued to serve useful in the Faction Warfare meta (particularly against the pilots of the growing Rapid Withdrawal group in the area), we didn’t ease off on what we started in Innia. It was in The Citadel that we finally had some space and opportunity to really grow and hone advanced doctrines like Heavy Assault Cruisers, Tech-3 Cruisers, and Battleships. While small gang warfare was and remains our primary wheelhouse, Omar Jumper made it a point to have a scheduled fleet every day of the week to help reinforce and establish these advanced doctrines and to help cultivate our fleet commander bench. Something that came along with regularly held battleship fleets was an interest from pilots in capital escalation when needed. The ability to drop triage carriers or counter-drop enemy triage carriers with dreads became a real need and it was one that our pilots and their alts came to embrace and support. As stated earlier, we have high expectations as a combat team, and we carry these expectations forward today in our culture. This growth and evolution of our doctrines helped (and continues to help) retain talent on the team who continue improve and separate us from the competition. We are able to field doctrines that require large amounts of skill points and pilot player skill, something that is somewhat notable in the Faction Warfare environment that has a lot of “brain drain” and exodus of talent to null sec and wormhole space. On 12 January 2015, the forces of Gallente Militia began an all-out siege to capture Hasmijaala and strike a devastating blow to our alliance. There have been articles written about the siege and some of the events leading up to Gallente Militia’s assault but the fighting reached a peak on 15 January when during a marathon session of fleet-commanding a defense fleet, TheLastSparton managed to accrue over 190 kills in only 8 hours. This day earned him the title “The Hero of Hasmijaala” and secured himself a role in Templis history. By the week’s end, the writing was on the wall. The Gallente would not capture Fortress Hasmijaala and eventually authored a concession of their attempt. While there have been small contingencies of Templis CALSF members attending player meet-ups before (including FanFest 2014, EVE New England 2014 + 2015 and EVE Dubai 2015), EVE Vegas 2015 was the first time a large contingent of Templis players met and partied together in real life. Main Photo Left to Right: Kazotic, Fidric, Cato/Jen Achasse, Stalence, Auroraqual, Luhen Ostus, and Doctor Explosion MD. As time continued though, content became stale. Our primary opponents living in the area were Aideron Robotics and Rapid Withdrawal. Come early 2016, Aideron was a shell of its former self and while Rapid Withdrawal had grown considerably, their greater fleet numbers often could not outmatch the skill of our pilots and fleet commanders. Our pilots would field Battleships or other advanced doctrines but would often have a difficult time soliciting a fight from RDRAW, even when their infrastructure was under direct attack. When they did fight, it was more often than not a trap with the intention to bridge in their Snuff Box allies. The pilots of Templis had grown tired of the content offered in the region. An initiative was spear-headed by Stalence and Charlotte de’Berry to find a suitable system to re-locate to. The scouting took the form of Fire Bases, forward deployed POS towers stocked with plexing and small gang combat ships. The Fire Bases were ostensibly used to forward deploy a small group of pilots and offensively plex systems high enough to call in the support of the greater alliance and militia to flip the system. The bases did well to win a few systems and improve the small-gang PVP acumen of our pilots. To leadership, it also served well to get a boots on the ground assessment of what activity levels were like in different areas and see which groups (both friends and foes) were active in the area. The Fire Base relocated six or seven times until all options were weighed, and a decision was made, Templis CALSF would return to Black Rise and make residence in Aivonen. The system offered closer proximity to fights with old-guard Gallente Militia and pirate organizations that frequently roam Black Rise. The system also allowed us closer proximity to allied alliances and a better base of operations to recruit new members from. Super capitals were moved in advance and pilots were asked to prepare. The announcement was made public on June 2 with the last remaining assets moved from Hasmijaala to Aivonen that following weekend. The return to Black Rise came with it the anchoring of our first Citadels and the capturing of the local moons and customs offices. Several Supercapital and capital brawls on our doorstep. After three years of unsuccessfully being drawn to compete in the Alliance Tournament, RNGeesus finally shown light upon us in 2016. Our name had been drawn and we were offered a bid to compete in the prestigious Alliance Tournament that is held annually by CCP. The co-captains for the team were designated to be TheLastSparton, Stalence, and Auroraqual with many more pilots actively participating in practices and theory-crafting fleet compositions. While usually held in late summer, the Alliance tournament was delayed until October in 2016 to coincide with the Blood Raiders’ Crimson Harvest event. The move was fitting as the Alliance Tournament prize ships for the year were Blood Raider themed and that Blood Raider pirate ships benefited from a points reduction to their hulls in the tournament rules. The team practiced Saturday and Sunday in the months leading up to the tournament start and on weekdays when practice partners were available. EVE Vegas 2016 ended up bigger and better than the previous year’s conference. Once again swag was on hand that included T-shirts, stickers, an even a giant Templis flag! The attendees list more than doubled in size from the previous year and were rolling deep enough to qualify for CCP/Planet Hollywood upgrades. While we didn’t win a suite, generous pilots kicked in for a pair of suites that became ground zero for everyone to kick back at when there weren’t keynotes, parties or other interesting events to attend. Friday night again marked a Faction Warfare roam with a lot of Templis and RDRAW pilots in attendance. Julianus Sotor and Jetstreem Denard were also in attendance from GMVA and Black Fox. Saturday night, we once again returned to the Chateau and witnessed an epic Permaband set while we made the most of the open bar. While many EVE Vegas pictures weren’t safe to post, here are some clean ones for the cut. While EVE Vegas 2016 raged on in the Nevada desert, a very different type of rage lingered in Templis CALSF’s home system of Aivonen: The Gallente Militia had begun an all-out siege to capture the fortress system. The siege raged on for several days but the system eventually fell to the relentless assault. It was the first time that the strength of Citadels in FW system sieges really came to light. Following the system loss, Templis CALSF resolved to leave NPC station life behind and formally move into Citadel structures full time.From the Citadels in Aivonen, we were able to recapture our home 2 days later. The Siege of Aivonen revealed itself to only be a minor set back to the momentum that was still growing for Caldari Militia. Within weeks the Caldari militia would enter Tier 3 for the first time in years and ultimately avenge Aivonen when we captured the Gallente strongholds of Vlillier and Eha, home systems of Gallente Militia’s old guard that have been held by the Federation in some cases for over 7 years!! Just before New Years (December 29th) Templis CALSF successfully onlined our first Fortizar-class Citadel in the Akidagi system. The anchoring gave us room to grow and mitigated the two primary issues we were having with Astrohaus-class Citadels – no market and the inability to dock capital ships. The market also opens up a viable market to compete with those in neighboring Ichoriya. The anchoring also signaled the formal move of Templis from Aivonen into the neighboring system of Akidagi. To commemorate the event, as well as to look back at our accomplishments in 2016 and to look forward to 2017, a new hype video / advert was released.